On Nov. 5, the District 3 Court of Appeals issued its opinion in Derleth v. Cordova, Nos. 2012AP2018 and 2012AP2802, which affirmed in part, reversed in part and remanded with directions. The orders were rendered by the Judges Conrad Richards and Michael Bloom of Oneida County. Missy Ann Derleth and Andrew Cole Cordova were married in 2006. They resided in the Appleton area, but moved to Rhinelander to enhance Cordova’s accounting career. When Derleth filed for divorce in 2011, she made arrangements to move back to the Appleton area with the children. At trial, Derleth introduced a Mapquest map that showed her intended home in Menasha was about 147 miles away from the marital home. The trial court concluded that the best interests of the children were served by having placement restricted to a 45-mile area. Derleth filed a notice of appeal from the divorce judgment in September 2012. The following month, she filed motions for contempt and for allowing a move of less than 150 miles. Following a hearing, the court issued an order stating that Wis. Stat § 767.481 and Groh v. Groh 110 Wis. 2d 117, 327 N.W. 2d 655 (1983) clearly provide that the court may not preclude Derleth from moving within 150 miles. Therefore, Derleth was allowed to move. Cordova appealed. In a decision penned by presiding Judge Michael Hoover, the Court of Appeals concluded that Groh is still good law and therefore the circuit court had no authority to prospectively order that Derleth not move beyond 45 miles from the marital home in Rhinelander. Interestingly, the court found that, per Wis. Stat. § 767.481, the legislature has made a judgment that moves of less than 150 miles are not subject to the best interests of the children standard. While the ultimate conclusion — that a court cannot condition placement on living within a geographically-prescribed area — is the right answer, the methodology of getting there was very confusing. 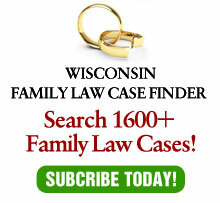 The appellate court said that Wis. Stat. § 767.481 “applies to the initial divorce judgment.” ¶17. But actually, it applies after the initial divorce judgment. I wrote this, with Judith Hartig-Osanka, in “Removal After Kerkvliet,” as seen in The Wisconsin Journal of Family Law in April 2000. A court does not grant placement to a geographical location. Rather, it grants placement to a parent. Although the “150 miles from the other parent” requirement in the automatic stay and removal statutes can be a guide to the court, it does not require that a court order a parent to live within that distance from the other parent. Instead, it serves as a prohibition during an action and a trigger for initiating a removal action after the initial award of placement. The case also is troubling for finding that the best interests of the children are not a consideration for intrastate moves under 150 miles. First, the 150 miles only triggers the notice requirements of the removal statute. It is quite easy to contemplate intrastate moves under 150 miles that would substantially implicate a child’s best interests. In fact, the Court of Appeals considered such a fact situation in Dohm v. Dohm, 2011AP2271 (January 10, 2013)(Not published, but citable). In Dohm, the Court of Appeals held that an intrastate move of under 150 miles constituted a substantial change of circumstances warranting a modification of placement. Pray tell, Court of Appeals: How can a substantial change in circumstances not involve the best interests of a child? Every order regarding custody or placement necessarily entails the best interests of the child and must be guided accordingly. I really don’t believe that the appellate court intended to say otherwise, but its language is, at best, troubling. There is a gray area where a parent wants to move prejudgment, but has not yet done so. Since courts cannot grant placement contingent on circumstances, including geography, the court has to make its decision based on the present circumstances. If matters change, triggering either the removal statute or the general modification statute, the court can modify placement. In any circumstances, however, the best interests of the children should not only be a consideration, but the paramount one. In this instance, the Court of Appeals reached the correct conclusion, but it is unfortunate they created confusion along the way.